Soon Yul Kang has been a resident artist at Kew Studio since 1998. Originally from Seoul, South Korea, she completed an MA in textiles(visual arts) at Goldsmiths College, University of London. She specialises in hand woven tapestries, but she also creates collages and mixed media works. For a number of years she has developed her subject, inspired by the concepts of ZEN-simplicity, stillness and emptiness, in terms of meditation and healing. She has more recently developed these concepts in her tapestries of serene landscapes. Her work is on permanent display at the West Middlesex University Hospital. She was also invited as a demonstrator at Art in Action 2010, 2011 & 2012 at Waterperry House, Nr Wheatley, Oxford OX33 1JZ..
From 29 August to 7 September she participates in The Exhibition of Korean Artists Association UK with theme of Collaboration at Korean Cultural Centre in London. 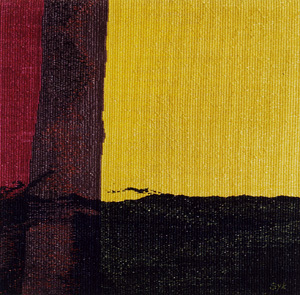 Also Soon Yul Kang was selected for Kate Derum Award Tapestry Exhibition, so her new small tapestry will be showing at Australian Tapestry Workshop from 29Aug. – to 27 Sep. 2013 in Melbourne, Australia. Click here www.soonyulkang.com for more images and information.